It's the polka parody legend, Weird Al Yankovic, as you've never seen him before! 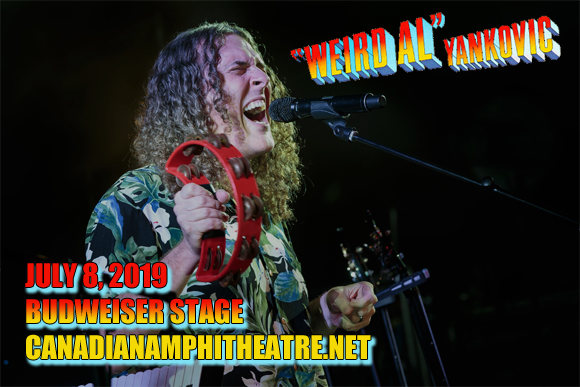 Weird Al comes to Budweiser Stage on Monday 8th July 2019, bringing his usual on-the-nose musical hilarity, but with a twist… This time he'll be joined by a full symphony orchestra and assortment of backing musicians, taking his incredible humorous songs to the next level! Get ready to laugh, marvel and sing along at this unique event! "Weird Al" Yankovic is an American comic singer-songwriter, film/record producer, satirist, and author, who has recorded more than 150 parody and original songs, performed more than 1,000 live shows and has sold over 12 million albums since his career began. Yankovic started out as a university DJ, and released his debut single, "My Bologna" (a parody of "My Sharona" by The Knack), in 1979. Today, Yankovic has won four Grammy Awards from eleven nominations, and has had four gold records and six platinum records in the United States. He is best known for performing parodies and pastiches of popular songs, often on the accordion in a polka style, with lyrics that reference popular culture. Often his songs are accompanied by a music video that also parodies the original artist, often remaking the original video scene-for-scene. This flair for making music videos led to Yankovic directing for other artists, including Ben Folds, Hanson, The Black Crowes, and The Presidents of the United States of America. Yankovic also wrote and starred in the film UHF (1989) and The Weird Al Show (1997). Almost 30 years into his career, in 2006, Yankovic charted his first top ten Billboard album (Straight Outta Lynwood) and single ("White & Nerdy"). Mandatory Fun (2014), Yankovic's most recent release, became his first number-one album during its debut week.